Rather than try and cram an entire wing into a single article, I’ve decided to tackle each boss in this week’s wing individually. This will allow me to go into much greater detail on each of the bosses, but feel free to let me know if you preferred having all of the bosses covered in a single article in the comments below. 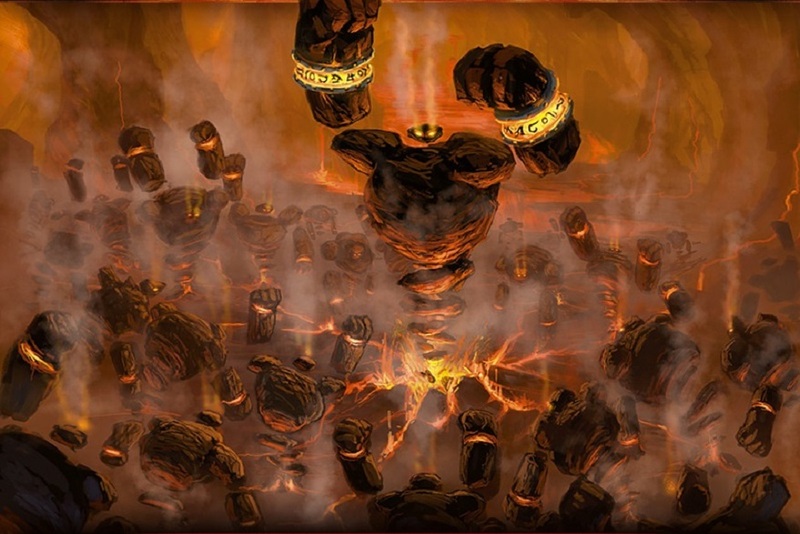 In the meantime, let’s get into the first boss of the new Molten Core wing for Hearthstone‘s Blackrock Mountain and go over the basic tactics that will earn you victory regardless of what cards you have in your collection. The Molten Core pits you against Ragnaros the Firelord and his three most powerful lieutenants, starting with the obsidian elemental Garr. His ability will deal 1 damage to all minions for only one mana and this ability will automatically activate at the start of each of Garr’s turns. It may not seem like much, but the real threat is what he’ll have on the board. Right at the start, Garr will have a full board of seven 0/5 Firesworn minions, each with a deathrattle ability that will deal damage to your hero for every Firesworn that dies on that turn. You’ll need to quickly take out the Firesworn one by one in order to minimize the amount of damage they do. If Garr is able to blow up even four or five of his own Firesworn in one go, it will be a massive blow against you. Even if he can’t get you on the first round, he has a spell called Rock Out that will summon three new Firesworn to the board. He also has plenty of powerful minions like Fire Elemental, Fireguard Destroyer, and Madder Bomber to finish you off, so you’re going to need plenty of survivability. Your best bet is going to be an aggressive Warrior deck with a focus on charge and enrage. Priest can also be very viable, but we’ll get to him later. For Warrior, you’ll first want to put some fast plays in your deck that can eliminate the Firesworn on cue. Your best card for this job is definitely the Fiery War Axe as it can guarantee that two of the Firespawn will go down alone without Garr’s interference. Charge minions like Bluegill Warrior and Wolfrider will only be able to get in one hit, but it’s still worth it to use them in this fight just to keep those Firesworn under control. The rest of your deck should take advantage of Garr’s hero power. He has to cast it at the start of every turn, so minions that profit from taking damage are a must for this boss. Minions like Acolyte of Pain and Amani Berserker will give you a strong edge in the fight, but one of the best minions to have is Armorsmith. Her ability to generate armor for you whenever a friendly minion takes damage will give you all of the endurance you’ll need for this fight. Gurubashi Berserker may seem great here, but he’ll prove too slow to keep the board under control. The more reliable option will be that Grim Patron you just picked up in Blackrock Spire. Ironbeak Owl can also be useful as a silence tool, but keep in mind that a silenced Firesworn will still count as a Firesworn. It won’t have a deathrattle of its own, but it will still multiply the effects of its kin. One last minion to consider is the Lil’ Exorcist from Goblins vs Gnomes. With the amount of Firesworn you’ll be facing, her battlecry granting her extra attack and health for every enemy deathrattle on the board can result in a huge minion at a low cost. Toss in a few spells like Execute, Battle Rage, and Rampage and you’ll be set to bring down Garr and claim your Druid of the Flame card. The Warrior class challenge against Garr will play out much like the tactics I listed above. The only thing you should be wary of is that you’ll be stuck with about four copies of Axe Flinger and it is too slow to keep control of the board. Save the Flingers after you’ve seized control of the game and they can help finish off Garr. Play them too quickly and they’ll only make a dent while you get burned. Win here and the Axe Flinger will be added to your personal collection. Finally, there’s Garr’s heroic challenge. 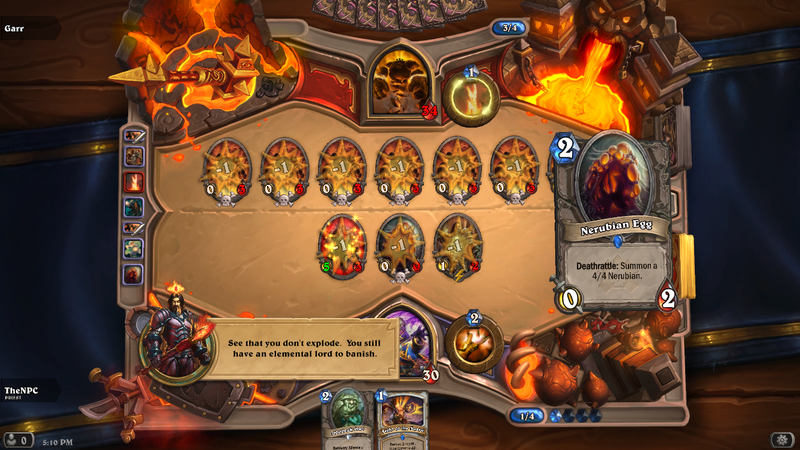 He’ll start with 45 health and his Firesworn will now deal three times as much damage with their deathrattles. There’s no doubt that he can now kill you with ease, but it is possible to bring him down on a budget with a fine Priest deck I found. If you don’t have the exact cards for the build, here are the basics to keep in mind. Your best chance is to get Mass Dispel early and use it to silence the full group of Firesworn. Once silenced, they’ll pose no threat and actually be a big help to you as Garr can’t play any more minions with his board full. Just hang onto a Circle of Healing to keep the Firesworn alive and a Silence or Ironbeak Owl in case Garr uses Mark of the Wild to buff one of his guys. From there, just smack Garr around and you’ll have the fight in the bag. Even if you can’t draw the Mass Dispel, this deck has plenty of options to turn the fight in your favor. Mind Control Tech and Cabal Shadow Priest will let you give Garr a taste of his own medicine by stealing his minions from him. It’s fun, but it won’t be enough to win you the game on it’s own. It’s mainly to buy you time and seize control of the board. Light of the Naaru and Earthen Ring Farseer should be reserved to keep you alive rather than preserve your minions. Your guys can wait for the Circle of Healing to be healed; you generally need it more in this fight. Finally, Northshire Cleric, Acolyte of Pain, and Power Word: Shield will help you with cycling through cards while Nerubian and Lil’ Exorcist will be your main damage-dealers. If you can’t build the exact deck, Injured Blademaster can be a suitable substitute for most cards. However, you will need to build most of the deck in order to stand a chance. Heroic mode is not for the faint of heart, but it will wait around if you need to stock up your collection. Molten Core is only just beginning. Stay tuned for the detailed guide for taking down Baron Geddon next time. Once again, let me know what you think of breaking up these guides into individual bosses. If there’s a demand to pool the entire wings into single articles, I’ll cover all of the remaining challenges for Molten Core in the next one. Until then, good luck with completing your collection.